Congrats to Tripleg for his 100-day reading streak!! 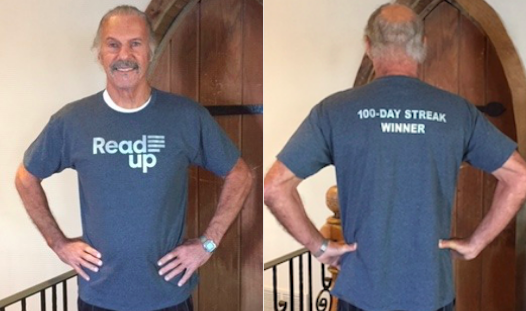 Nothing makes us happier than hearing from members of our community about the positive experiences they’re having on Readup. Recently, one of our top users, Tripleg, broke into a TRIPLE digit reading streak! Yes, you read that correctly — he’s read a full article per day every single day for over one hundred days in a row. What an achievement! And it looks like he’s not stopping any time soon! As of today, he’s at 110 days.